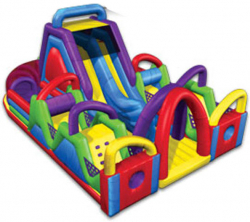 Three piece obstacle course with 17' slide. Great for middle school aged kids. 2 opponents compete through a series of squeeze plays, climbing walls, slides, and more. Must be at least 42” tall.